A Modern Architecture class led by Interdisciplinary Studies Coordinator Dr. Jeffrey Collins recently took a visit to the active construction site of the I.W. “Ike” Cousins Center for Science and Innovation to see the building process firsthand, from the foundation to outfitting of laboratories and classrooms. 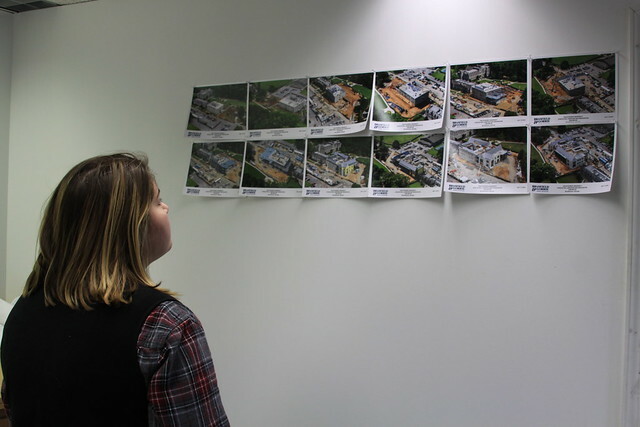 Students were led by Brasfield & Gorie Project Manager Bo Evans, who showed the class blueprints, AutoCAD drafts, and aerial site photos before guiding them through the renovation floor by floor, while pointing out pertinent design elements and challenges of converting the former Goslin Hall. Dr. Collins said seeing a building under construction was important for students, as most of examples used in class are completed buildings, and that architecture not only encompasses the artistic, aesthetic design, but also mathematics, engineering, planning and organization.